1) Modern Times-- When I was in sixth grade, we were asked to write a biography on any famous person, living or dead. At the time, I had a crush on Robert Downey Jr. and had somehow gotten Downey confused with the character he was playing at the time, Charlie Chaplin so I picked Chaplin. While doing research on the Little Tramp, I tracked down several of his old movies and immediately became drawn to film as a valid art form, especially when I placed Modern Times in my VCR. 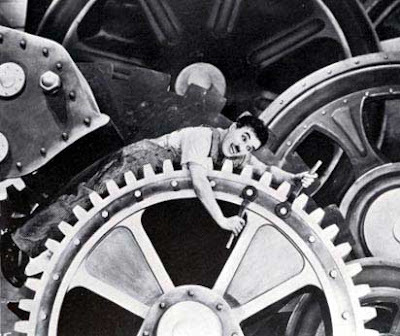 Chaplin’s use of political, sociological and economic metaphors and the way he was able to blend humor with pathos really changed the way I looked at cinematic comedy. 2) Moonstruck—As the third generation Italian-American on my mother’s side, this is the first film I recall seeing in a theatre that wasn't animated along with my mother and grandmother. Despite finding it boring as a first grader, since then I've always been fascinated by passionate, dark-haired character actors including Moonstruck's Nicolas Cage and fostered a love and respect of acting that still exists to this day. 3) Pulp Fiction— Tarantino introduced me to the challenges and joys of nonlinear storytelling, playing against audience expectation by topping every unpredictable scene he’d just completed, and more than that, for inspiring me to track down the classic and foreign works that he’d blended together like a master chef for his own Cannes winning recipe. 5) Singin’ in the Rain— If you’re able to watch Gene Kelly splash through those puddles and grab onto that lamppost on a sheer romantic high without your pulse quickening, I don’t think we can be friends. Hands down, it’s the most joyful moment ever captured on film—the equivalent of a cinematic antidepressant without all of those scary sounding side effects. 6) Ferris Bueller’s Day Off— I realize I just lost most of you with this choice but give me a moment— I came of age in the era of John Hughes and like his characters, grew up impossibly precocious in the Midwest with a great deal of blue collar pride. He wrote smart comedies for brainy kids unafraid to share their emotions and even more willing to take a risk to find their own identities, remain loyal to loved ones and friends, and ultimately—as in the case of Ferris—have as much fun as possible without hurting anyone in the process. 7) Hannah and Her Sisters—Woody is one of the biggest influences I had on my own creative writing and Hannah was not only my gateway Woody Allen film but one that’s still quite dear to my heart. Possibly it’s because the three characters are women or even more possibly it’s because of Woody’s memorable character who goes through an unbelievable existential crisis only to discover that—much like fellow film lovers who constantly have to defend our passion—cinema is a lifesaver and the most humanistic medium around, whether it’s the Marx Brothers cracking us up in Duck Soup or other classic stars making us cry in a vintage weepie. 8) The Usual Suspects—One of the first independent films that I knew I had to check out no matter what. I remember conning my big brother into accompanying me and convincing my parents to drive us over an hour to see it. I found myself not simply blown away by Spacey but especially transfixed by the film’s amazing twist ending and the way that—without us knowing—the director and writer had played on our own stereotypes, fears, and assumptions in pulling the wool over our eyes making me infinitely jealous yet completely awestruck as a budding writer. Moreover, it inspired me to seek out classic film noir and I cite Suspects for helping me earn a screenwriting award for the first contest I ever entered at fifteen, with a work that-- of course-- was not only noir but also contained a humdinger of a surprise ending. 9) Red— One of the all-time great foreign imports ever to hit American soil and possibly one of the first foreign films I ever saw as a young film buff. More than just being awed by Kieslowki’s masterwork which had so captivated my idol Roger Ebert that he mentioned it on nearly every show the year it first came out, I’m still continually inspired by its important message of fraternity and brotherhood and how one should never judge another too harshly as much like the character of Valentine and the Judge, a true friend (which is just as important as a romantic soul mate) can be found where one least expects. It reminds me again of the immediate bond I feel with those who share my passion for great film. 10) Antonia’s Line—While I think I may have seen this as a teen, it didn’t have an impact on me until I saw it at precisely the right time when I was roughly twenty-two and trying to figure out which field to go into professionally. Having begun college at the tender age of sixteen, I was one of those people who found themselves drawn to several areas of study, seeking out new courses on a whim and changing majors with every school I attended. After leaving a baccalaureate program in English Literature in the southeast and returning home to southwest, I decided to take a few film classes to try and reignite my love of cinematic study once more. As soon as we spent a week evaluating Marleen Gorris’ existential, feminist masterpiece Antonia’s Line, I discovered my passion for writing about cinema and opening up a viewer’s eyes to both the techniques employed on celluloid and also the urgent way that film causes us to look at our own lives as globally engaged citizens. Click here to visit our Video Screening Room to check out clips from some of these excellent films including some of the cited scenes such as the Suspects conclusion, Gene Kelly’s splash filled dance, and the end of 400 Blows. Note: Be sure to explore the rest of the new features available on the website including Jen's P.O.V. Page, the Home Page featuring Father's Day Video Clips, and more.